Especially when it comes to building and office environments. So, for the purposes of this piece, the focus will be on how the term relates to and deeply affects workplace elements both physical and psychological in nature; and I will identify several ways to incorporate these ideas into the office environment. Please read on! The word sustainable has various meanings which offer some relevant insights for individuals and organizations to consider and apply when thinking about people and place. With that, we're going to refer to four common definitions as a guide. Let's begin with the first definition. 1. Capable of being supported or upheld, as by having its weight borne from below. One way to interpret this, is to consider how a company’s culture more or less sustains its own prosperity. Few organizations are successful without a cohesive team of people who together carry out the corporate mission, support the leadership, and essentially make up the business’s cultural foundation. When the ground beneath the company culture shifts, as commonly occurs during transitions like an office relocation, this support structure can destabilize and may cause permanent and irreversible damage to the company’s foundation if the change is not carefully overseen, nor expectations proactively managed. For this reason, leaders ought to recognize and embrace the important role that culture plays in maintaining a solid and supportive infrastructure to sustain the success and longevity of the business. Proper strategic planning and management of change can actually bolster the flexibility and resiliency of a company’s culture. In other words, a psychological component of sustainability in the work environment lays with the ability to successfully gain employee buy-in, support and excitement over an office environment transition, so as to more effectively lead the community through a positive and lasting set of changes. 2. Pertaining to a system that maintains its own viability by using techniques that allow for continual reuse. One perfect example of this definition in the physical sense, would be the use of architectural building materials such as demountable wall systems - i.e. a continually reusable product. Wacom, a Portland, OR tech company who makes interactive pen displays and tablet styluses, recently opened their new headquarters where they utilized modular architectural glass walls to build out their conference rooms and offices. This is the ultimate of sustainable design approaches. Not only do the wall systems reduce the amount of construction materials that otherwise end up in landfills (think carpet, drywall, 2x4 scraps), using demountable elements also drastically affects air quality by diminishing the hazardous materials that people breathe (such as construction dust and fumes). Furthermore, at the speed with which technology alone changes, not to mention the ebb and flow of what’s defined as ‘functional space’ for the people who use it daily, it’s somewhat a mystery why traditional walls are still so predominate in tenant improvement projects. When office leases are shortening and space turn-over is practically a given every 5-10 years, or even less, the ability to reconfigure offices and conference rooms, or quickly re-skin a demountable wall with writable surfaces, glass, or graphics, are just a few of many ways to reuse the architectural components to save both time and money. Other ways to decrease both financial and environmental impact by investing in a wall system, are by means of making electrical, data or technological alterations. The ability to quickly remove/replace wall tiles decreases downtime for a space, the need to hire drywall installers and painters becomes moot, and there is significantly less construction waste to dispose of. 3. Able to be maintained or kept going, as an action or process. The meaning of sustainable in this case, relates to the act of maintaining a procurement and purchasing process. When it comes to desks, tables, office and lounge seating, sustainable practices can take varying forms. Of course there are the obvious, such as buying from manufacturers who source earth-friendly materials, and whose products meet environmentally friendly criteria. The less obvious however, would be in relation to obsoletism. Sourcing furniture, fixtures and equipment from manufacturers who frequently change materials/colors/designs, or regularly discontinue items isn’t a maintainable process or action. Nor would be selecting custom-made, built-in, or otherwise not easily reproduced products for more frequently purchased items such as desks, workstations, monitor arms and such. One-of-a-kind pieces are better left for making aesthetic design statements, and are not typically the easiest nor most inexpensive way to maintain or keep going with as a company expands its employee headcount. 4. Able to be supported as with the basic necessities or sufficient funds. In this example, I am equating sustainability to that of supporting employee well-being. When thinking about basic necessities in relation to people and place, furniture and fixtures that support proper ergonomics and good habits such as avoiding neck/eye strain and prolonged sitting, are essential elements to sustaining a health positive atmosphere for people. Sufficient funds comes to mind when considering how successful companies offer wellness programs that incentivize participation and incorporate well-being components such as: sight lines and easy access to drinking water, healthy snack/food alternatives, optimal air quality, and increased natural lighting. Straight from Delos’ Well-Building Standard which focuses exclusively on human health and wellness, these components act as a means to ‘fund’ and sustain a richer and more healthful workforce. 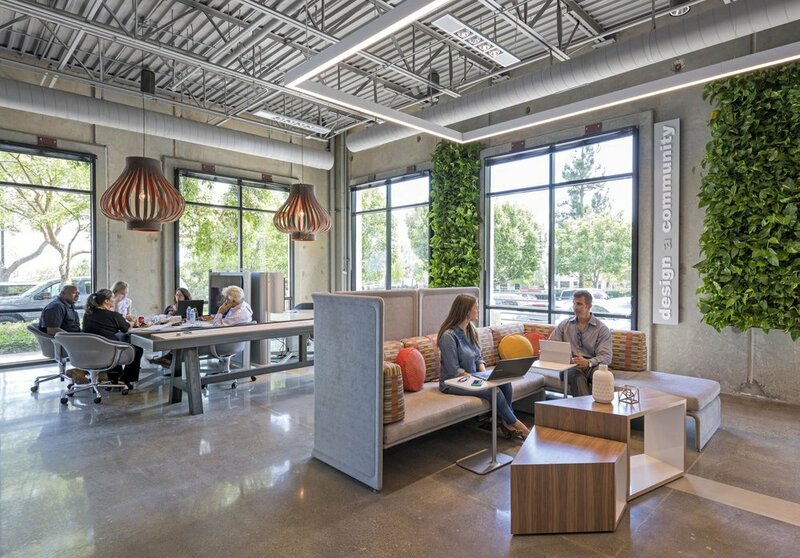 In closing, when it comes to interior work environments, being sustainably-minded about both people and place acknowledges that the two go hand-in-hand toward maintaining a robust culture and prosperous business. and the environmental impact of the built office environment is minimal. Sustaining the environment, sustains the people. Sustaining the people, sustains the business. You get the idea...so run with it!